Midget lives at Wood Gems in Kingman, Arizona, with his friends Cheezit and LilBit. 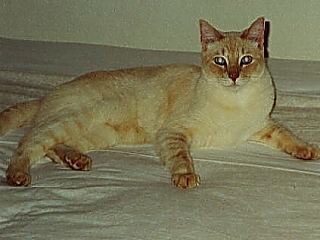 He is a flame-point Siamese born in 1996. His nickname is "The Brat." He and the others were rescued from SPCA shelters around the country. "We have had Flame-Points since 1971 and they have all lived well into their teen years. They have the greatest personalities and intelligence I have ever seen in any breed and are really 'the kids', even if we did have 8 of those at one time as well." Story and pictures sent in by Stew and Peggie Evans of Kingman, Arizona.